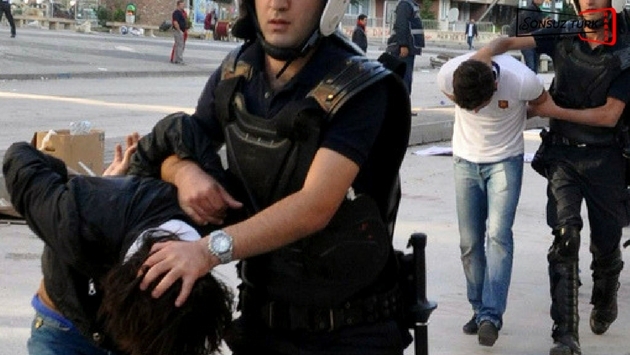 A total of 26 people have been detained in Diyarbakır province as part of operations against the Kurdistan Communities Union (KCK), an umbrella organization that encompasses the Kurdistan Workers’ Party (PKK), the Sendika48.org news portal reported. According to the report the detainees are as follows: Nalan Gözden, Mehmet Güzel, A. Baran Dağ, Sibel İldan, Ercan Aslan, Yüksel Baran, Zeynep Altınkaynak, Sara Aktaş, Ayşe Gökkan, Şah Can Tünen, Salih Keleş, Selahaddin Kaygusuz, Hatice Uçar, Kerem Duruk, Necla Nergiz, Sibel Elvan, Devran Balkaş, Hasan İnatçı, Helbest İlkan, Cengiz Sökmen, Paşa Şeker, Ebubekir Budak, Ayşe Yağcı, Evren Ortaç, Hanım Ayhan, Gül Kızıltaş. Turkey has stepped up its crackdown on Kurdish politicians in recent months. Trustees have been appointed to dozens of municipalities in the country’s predominantly Kurdish Southeast while Turkish courts earlier this month arrested 10 pro-Kurdish Peoples’ Democratic Party (HDP) deputies including the party’s co-chairs. Turkey has also arrested dozens of local Kurdish politicians on terrorism charges. The DBP is the local affiliate of the HDP.